A few weeks after we launched our book export service in the German Wikipedia, a user asked us to drop our arbitrary 500 articles limit. In our conversation with the user, we learned that he planned to print the complete Wikipedia. After doing some back of the envelope calculations and exchanging emails, we mutally agreed to drop his plan. But the idea was born and stuck with us. 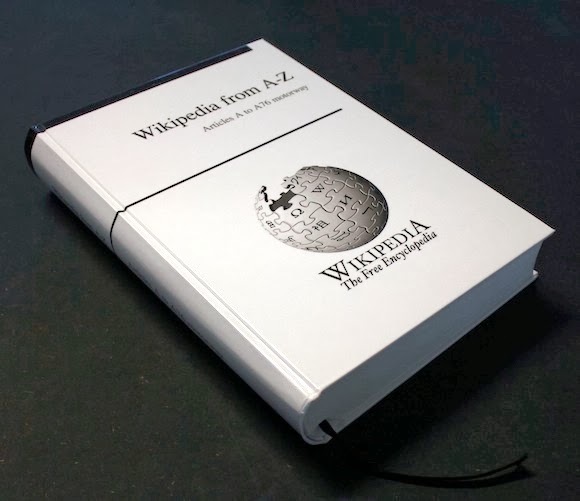 The Wikipedia community uses books as a metaphor to compare the size of Wikipedia with its printed predecessors like the Encyclopædia Britannica. There is even a dedicated page which continously updates a visualization based on the current number of articles. 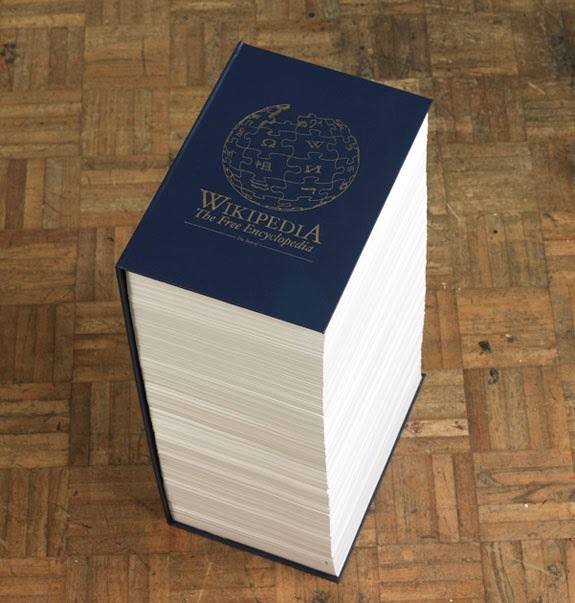 Currently, the page estimates that a printed Wikipedia will fill almost 2,000 Britannica-sized volumes. In the past there have been a few attempts to create a printed edition of Wikipedia. 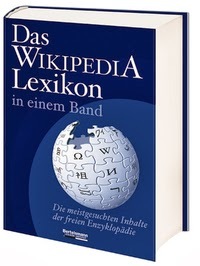 In 2008, German publishing house Bertelsmann released an abridged version of the German Wikipedia, featuring about 20,000 abbreviated articles on 992 pages. Shortly afterwards, student Rob Matthews created a book containing more than 400 featured articles from Wikipedia on 5,000 pages. But even his effort covered only 1 out of 10,000 articles (0,01%). In 2010, British artist James Bridle created a 12 volume (7,000 pages) set of books featuring all 12,000 changes of the article "The Iraq War" between 2004 and 2009 to illustrate the discursive ways of our culture. And of course there is PediaPress, our own humble attempt to create a service that allows everybody to print a book from an individual selection of articles. As written above, the idea for a printed edition was floating around in our heads for years, but we didn't know how to tackle the cost. Crowdfunding changed the situation and fits the Wikipedian community approach very well. So, when somebody brought this topic up in one of our team meetings a couple of weeks ago, we said "why not" and gave it a go. Maybe we can find other like-minded souls (like you?) who love books or are just as fascinated by the idea of an (instantly outdated) snapshot of our current knowledge according to Wikipedia. We came up with some perks that will allow you to participate in the project and eternalize your contribution by adding your name or even a personal dedication to one of the volumes. Check out our Indiegogo campaign, tell your friends about it on the interwebs and become a sponsor of this unique endeavour. If you have tips or questions, don't hesitate to contact us. We are looking forward to meet you in front of a large book case at Wikimania London in August 2014. PS: If you happen to know a manufacturer of huge book cases in search of a unique showcase for their product - let us know. PPS: We have neither decided on the destinations during a travelling exhibition of the books nor where they're finally put to rest. Let us know if you think that your local museum or library is a good fit.